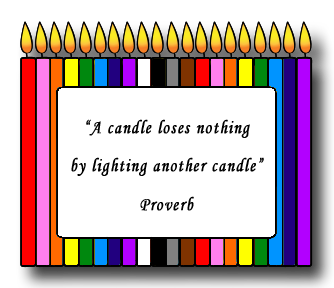 Coloured candles have a more meaningful significance than simply a decorative value. Their therapeutic and healing effects must never be underestimated. The various colors have a great influence upon our health, thoughts, and actions. The proper choice of color is of the utmost importance for one's success (see list below) when burning candles and when combined with prayer and faith, lighting and burning coloured candles can produce miracles. The colour of the candle and it's vibration is activated, released and amplified when it is lit. As the candle burns, the colour is released into the surrounding areas and affects those in this area. For instance lighting a candle in a healing room, during a healing, will enhance all the energies; both in the room as well asin the patient. You can also light a candle in remembrance of someone that passed on or to light their way to the next world. Two examples jump to mind here, the Catholics as well as the Jews light them for the departed, secondly in times past the wife of a sailor would put one in the window to light the way home for her husband. You can light a candle to power up any intention following the simple rules for their use. The colour of the candle that you use, is determined by your intention or the kind of healing needed. For example lighting a white candle for love, light and gratitude in your life or lighting a green one for more abundanceand prosperity in your life. Consult the list on which coloured candles corresponds to different conditions and intentions given below. The red coloured candle are a symbol of love and health and the attainment of ambitions. It is the colour of passion and sexual potency which are expressions of our primal life force. It also helps to create a new reality. Its a symbol of love and stimulates forgiveness of self or others. It awakens a consciousness of clean living and honor and helps you come to terms with emotional vulnerability. It stimulates purity of intention and it can awaken a vision of truth and success. Orange coloured candles are a joyful and magnetic and a symbol of joy and creativity. It can help to attract new people, resources, animals, and other things you want in your life. When looking for the right connection as far asyour career or a healing treatment is concerned orange is a good colour to use. Yellow strengthens the mind and gives us the power to "hang in there" when all odds are against us. In it we can learn to see the fulfillment of our desires. The gold shades assist in understanding and stimulating dream activity. This is the candle of growth and movement. It balances the energies of the body and mind. Green triggers past-life recall and is therefore very advantageous to locatingthe true source of an ailment. It can stimulate greater youthfulness, abundance and fertility. Is a symbol of spiritual understanding. It awakens our innate abilities to perceive and helps to balance and align ones ethics. It is essential for those in business. It is alsoa symbol of life, and it awakens within the consciousness agreater faith in life's processes. Blue is powerfully healing for children. It has alsobeen known that blue candles have been burned in various rituals to bring in quick money. These are symbols of spirituality, power and mastery. They awaken success,elevation and attainment of spiritual desires. These candles help develop inner peace. When burned with a silver candle it facilitates communication with the deceased. Its a symbol of purity and power. It amplifies the effects of anyother colour it is burned with. It promotes purity and stimulates balancing, cleansing and progressive change. Unless it is an extremely cheap one, when a white candle smokes, it indicates that the negativity in the area is being burnt off. When the smoking ceases, the area is cleansed. Is very powerful. It helps to protect you from negative thoughts. It is very useful when you are going through a divorce or difficult time at work and is most effective when burnt with a white one. Too much black can manifest depression, however if burnt with a white or yellow candle it will help avoid the deepening of depression. Is a symbol of clarity and stimulates intuitiveness related to past lives. You can meditate upon it to see how best to initiate new activities. It awakens that level of the subconscious mind that is aware of how the wheels of life areturning for you. It awakens our most innate primal intuition. Brown is neutral. Its grounding and provides certainty in life. It can awaken greater discernment and certainty. It can also be meditated upon to help uncoverlost articles.It is a colour associated with St. Anthony who is the patron saint of lost things. Color is very important in the healing process. In my Color Healing Course you wiil learn how to use color in all areas of your life to improve your well-being.